The diverse and controversial world of contemporary Milton studies is brought alive in this stimulating Companion. Winner of the Milton Society of America's Irene Samuels Book Award in 2002. 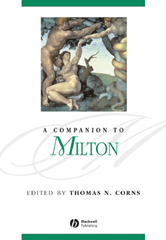 Invites readers to explore and enjoy Milton's rich and fascinating work. Comprises fresh and powerful readings of Milton's texts and the contexts in which they were created, each written by a leading scholar. Looks at literary production and cultural ideologies, issues of politics, gender and religion, individual Milton texts, other relevant contemporary texts and responses to Milton over time. Devotes a whole chapter to each major poem, and four to Paradise Lost. Conveys the excitement of recent developments in the field.